Have you seen it yet...the show on PBS called Call the Midwife? It aired on our PBS this past weekend but I didn't get to watch it...I recorded it later and got to sit down and watch it last night. It is one more show worth watching for us. 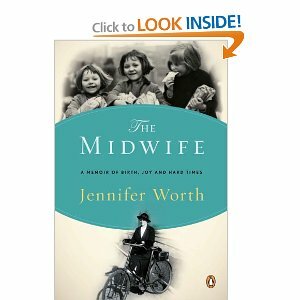 It is based on these memoirs of Jennifer Worth who left a comfortable home to become a nurse and midwife right after WWII...she moved into a convent to work with nuns and other nurses who were already doing the work. There is a housing shortage at that time and people live in ways UN-imagineable to us today. Just so crowded...and such squalor. In my opinion, PBS has some of the best shows on television...we have been hooked on it forever. One that was a favorite with both of us is Foyle's War. We are now re=watching the episodes through Netflix. I was going to try to list more of what we have watched and/or rewatch...and the list is endless. We almost always watch Masterpiece Theater or Masterpiece Mystery....we are very seldom disappointed with those shows. Let alone shows like Red Green...for fun, or The Joy of Painting, Quilting Arts, or Fons and Porter for instruction. I just wondered, are there shows you always watch...and what are they? I'll add that to my reading list. Red Green is a hoot! I love the show As Time Goes by. Have very wonderful memories of watching All Things Bright and Beautiful with our kids when they were small. Favorite show now are on USA White Collar, Necessary Roughness, Fairly Legal and Covert Affairs. Also like NCIS, Pawn stars and American PIckers. I also watched this on PBS last Sunday and I was hooked. Had heard good things from the British papers about this. the only thing i ever watched on PBS is River dance and a couple of guys playing violins. PBS is a good station. Many worthwile shows on it. I'll be busy for about a week, so I won't be posting or commenting, but don't give on me, I'll be back.